It’s been about a decade since my last breakup. And it was a doozy. I found myself in a complete tailspin, totally disconnected from the idea that anything would ever be good again and overwhelmed by everyday life. It was a long, lonely road; one that I’m glad moves farther behind me each and every day. But the holidays left me with the nagging feeling that another breakup was coming. My relationship with baked goods had kind of gotten rocky. I had allowed myself to be wooed by the butter and sugar and all the promises of good times. I chose to ignore the red flags that pleaded for my attention – the way the baking supplies took over the pantry, the subtle snugness of my jeans, the sugar crashes that wiped me out in the afternoons. I told myself that there wasn’t a problem because I dreaded the idea of a breakup more than the newly gained pounds that were registering on the scale. I’d like to say that I found the courage to do what had to be done and walk away from the relationship. But I couldn’t do it. I couldn’t break up with baked goods. It’s the bad boy that keeps asking for one more chance. And I’m a sucker for it. But instead of jumping back in head first, I’m trying to set some boundaries in the relationship. No, I will not see you each and every day. Some weekends we will hang out, enjoy each others company, and others we won’t. You will not call me late at night and if you do, I will not respond. I will want to. But I won’t. BAH Note: I am slowly whittling down the number of Cooking Light recipes that have been long neglected in my recipe folders. According to my calculations, this one has been hounding me since 2006. The folks at CL say that a serving is one cookie. I say that’s a boundary that is just begging to be broken. Cream the butter and granulated sugar in the work bowl of a stand mixer fitted with a paddle attachment about 3 minutes or until well blended. Add the corn syrup, vanilla, and egg and continue to mix for another 3 minutes. In a separate bowl, whisk together the flours, baking powder, baking soda, salt and 1/4 teaspoon cinnamon. Slowly add the flour mixture to the butter and mix until just combined. Wrap the dough in plastic wrap and refrigerate for at least 1 hour. When ready to bake, heat the oven to 375 degrees and combine the turbinado sugar and 1/2 teaspoon cinnamon in a small bowl. Remove the dough from the refrigerator and shape into approximately 48, 1 teaspoon balls. Roll the dough balls in the cinnamon sugar and place approximately 2 inches apart on a parchment lined sheet pan. Bake for 12 minutes or until golden on the bottom. Transfer to wire racks to cool completely. Breakups Cinnamon Sugar Cookies Cooking Light Who Eats Just One Cookie? These look great, Wendi! They look kinda soft and chewy, are they? If so, that boundary you speak of that is meant to be broken is definitely going to be broken – multiple times – by me. Joanne, these aren’t a soft and chewy cookie….lord help me if they were. They are crispier and snappier in a lovely way. I hope you won’t let that keep you from trying them. And really, who ever heard of a one teaspoons cookie being a whole serving? That’s just silly. I’ve been trying to set up some boundaries with sweets too. There’s a stretch of time where I’m tired every day, and I think sugar is the reason. It’s a work-in-progress for me. But you’re right, Cooking Light is a great resource. I would always break the rule of eating just one cookie though. Jen, I’d like to meet the person that can eat just one wee cookie and be satisfied. Sometimes boundaries are just made to be broken. I think once I finally get through the last of the CL recipes lingering in my folders I may have to start buying the magazine again. oh awesome, Cookie Booty Calls. LURVE those on a friday night, after being out. honey, when a cookies calls, i ALWAYS answer! Lan, truth be told, I don’t think I’ve ever said no to a cookie. One serving is one cookie? Come on. Who can stop at one? My point exactly Brooke. And they are wee bitty cookies to begin with. As if. these look fabulous! and i never abide by the 1 cookie boundary! Natalie, I don’t think I know anyone who could abide by a one cookie limit. I’m with you–people who just eat one cookie are mutants. Especially when they look as good as these! Kitch, I think these cookies would make a great snow day project….now if I could just get that snow day! Oh these look real good. I made some oatmeal cookies last week and it was real hard to not eat them all at once. I really wish I could stop at one cookie!!! Elizabeth, now I want oatmeal cookies! I’m suspicious of the words “cookie” and “light” used together. Because if it’s going to be worth it, do I really want it to be light? I’m actually pretty good at managing my sugar habit, mainly because I have strict boundaries. 1) No store bought crap baked goods (which is a good tool in the office). 2) When baking, have an escape route mapped for the baked goods. If something is hanging around the house, I eat it. So make a plan to get it out! 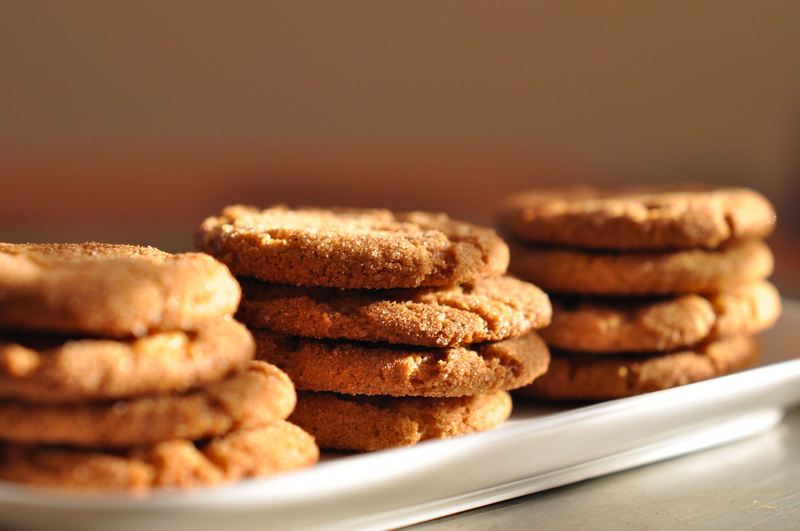 It’s much easier to eat just one cookie at the office than it is at home! Beth, I think the Cooking Light spin is that the official serving size is one small cookie. Because there is nothing else “light” about the recipe. I have been falling prey lately to Trader Joe’s dark chocolate peanut butter cups. But I don’t usually buy sweets at the store either. And I wholeheartedly endorse the office as a baked good escape route…I use it all the time. For some reason, I’m able to exert more self-control around crunchy cookies than chewy cookies. Chewy cookies are the John Mayer of baked goods. They’ll always hurt you in the end. Oh Ali, love the John Mayer comparison. I’m sure you could tinker with these to get them softer. But I can attest that they are fantastic with a glass of milk or cup of coffee. Mmm…I’ll try these with coffee. I’ve been on a plain Digestives kick for the last few weeks and I’m ready to switch to another (and this time, homemade) crunchy cookie. I had the best “digestive” cookies when I was in Europe. Somehow the notion of covering a cookie with chocolate and still thinking it’s “healthy” doesn’t seem to bother the Brits or Scots. And, I totally know how you have been feeling about baked goods. I am trying desperately to cut back (how much I eat, portion sizes, etc) because I can no longer ignore it, either. Jen, I still can’t accept a single cookie as a serving but they are small which may help those of us who are portion size challenged (me) from overindulging. Then again, maybe not. Cinnamon spice is so perfect for winter… thx for the post. Evan, I will trade you some of these cinnamon sugar cookies for one of your buttermilk waffles. These look lovely! There’s no way a serving size of one cookie would work for me, though!! Tracy, glad to know I’m not the only one who thinks a single cookie is not a proper serving. All of Cooking Light’s serving sizes generally are cracked. I have been disappointed with entrees that are supposed to serve 4, which should be enough for me, my husband, one adult stepdaughter, and leftovers for my husband’s lunch. I have found myself carefully dividing the dish in thirds so that we all get just barely enough for our meal, never mind leftovers. Jennifer, I’d like to know who the genius is at CL who is determining portion size? Must be some crazy new math they’re using. These look great! I can also imagine the wonderful smell they would have filled your home with when baking them! Jennifer, these cookies smell heavenly. I am enjoying some of your lentil soup tonight. It is one of my favorites. Wow, really? That’s so sweet. I am so glad you enjoy my lentil soup. It’s one of my favourites too. It’s a bit too hot here for it at the moment though! I’ve bookmarked these cookies to try. Not just because I am sure they taste wonderful but also because of the smell! Oh yes, love the lentil soup. Last time I made it, I put in some parmesan rind for a another layer of delicious flavor. Could you maybe send some of that lovely warm weather our way? This winter has been especially dreadful.